Cae Ysgubor may be used by members without prior booking for only £7 a night, and they may introduce up to three guests for £10 a night. We advise that you check the availability on the website as the bunk house maybe rented out to groups exclusively occasionally. All members have to do is simply pay a once-only charge of £20 on https://webcollect.org.uk/lmc/subscription to be issued with a hut key – or alternative contact the Membership Secretary at membership@lancsmc.org. Cae Ysgubor is available to rent, for prices and to arrange please contact our Hut Booking Secretary: Dave Sudell – Tel: 07812 390263 or email hut-booking@lancsmc.org. 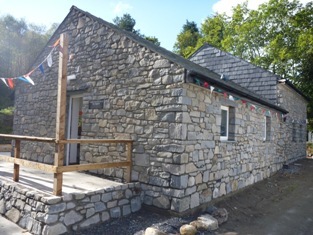 The map ref for the bunkhouse is SH599485 and the postcode is LL55 4NE (although not very useful as this covers a large area; except to get you to Beddgelert if you are using a Sat Nav). As you approach Beddgelert from Pen y Gwryd (i.e from the direction of Capel Curig) along the A498 turn off left sign-posted the Sygun Copper Mine; this is about 1.5K before Beddgelert. (If you get as far as the Cae Ddu campsite on the left, you have gone too far, so turn round and go back to look for the Sygun copper mine). Follow the narrow road over a bridge, past the mine car park (sharp right bend) to the bunkhouse on the left. This is about 600m from the main road. Park opposite. Alternatively, some SatNav/google systems might take further the down A55 coast road and then into Beddgelert from the Caernarfon direction. This is OK but in this case you will need to follow the signs out of Beddgelert on the A498 towards Capel Curig and look for the Sygun Mine signposts on the right. Direct mainline train services run to nearby towns of Bangor (linking London Euston) and Porthmadog, both with connections via the Snowdon Sherpa bus service. The romantic option is to arrive via the Welsh Highland Steam Train – then walking through the village towards the Copper Mine, crossing the first bridge as you head towards the Copper Mine. The Snowdon Sherpa bus timetables can be found here. The car park on the bunk-house side of the road is capable of accommodating three cars/two minibuses for disabled. This parking area is enclosed by two 12.5m safety black/yellow chains (plastic) separating it from the road. On arrival these can be unhooked at the bin enclosure and, together with the central post, moved to the post at the stream end. On departure, please reattach the chains and posts. There is a locked barrier across the car park opposite the bunk house. The key for this is kept with the shed keys on a hook by the electric cupboard in the hall. However, there is room for four cars to park off the road outside the barrier, making sufficient parking for most visits. If your group includes children or for any reason you feel it appropriate to leave the chains attached for safety reasons (e.g. with respect to traffic on the lane), you will also find two “Danger Traffic Stop Look & Listen” signs stored in the right-hand shed that can be hung on the top chain. In addition, there is a “Slow – Children & Animals” sign and its base which can be put by the road in front of the bin store. Please ensure these signs are put back in the shed prior to departure. Your Salto blue key fob gives entry through the main door, which is at the rear of the bunkhouse. To unlock – present fob to circular black knob by the door handle. You will hear a brief sound as the mechanism operates and a green light will show for a moment around the lock. Now turn the knob fully anticlockwise and depress the door handle. If a red light shows, this means that the particular fob is not programmed to operate the door – it may have been disabled. If you do get a red light, you will need to contact the bunk house Warden or another officer of the LMC. When you leave the building, you will need to re-lock the door using the key fob. First, close the door with the handle, moving it upwards so that all the upper and lower two latches of the door are engaged. Now hold the fob to the black knob and then turn the knob clockwise. The main door can be locked at night from the inside, using the turn-key. People will still be able to enter from the outside by using a key fob. On entry to the bunk house, press the green button immediately on your right. This activates lighting and power and starts a 40-hour timer which, on time out, will switch off all lighting and power. If you are still occupying the building when this happens, just press the green button again. On leaving the bunk house press the red button by the door. This will switch off all lighting and power. The main electrical power distribution board is fitted with a Residual Current Detector (RCD) whose function is to detect and isolate any faults on the system thus preventing persons from receiving electric shocks. RCD’s are very sensitive, for example they may trip as a result of a light bulb blowing and it will then become necessary to reset the RCD. A guidance note is posted in the electrical equipment cupboard. No-one should go into the cupboard other than to reset the RCD. There is a 3-phase electricity supply to the hut. If one or more of the mains power supply phases to Cae Ysgubor is down, the emergency lights will turn on. Once the power comes back on, the emergency lights will go off but you will need to re-press the green button. The air-source heat pump is operational and THERE IS NO NEED TO ADJUST THE SETTINGS OR CHANGE THE THERMOSTATS! There is a permanent supply of hot water 24/7. The background temperature is set to 15C (and 18C for weekends). However, if a small group is at the hut mid week, you may want to temporarily have some additional warmth in the main room. There is a wall heater in the sitting area for this purpose. Please switch off the wall heater when no longer required. The water is mains supply and fit for all usage. The main stop tap is in the lounge/kitchen area down at floor level between the cooker and the end external door. This will stop the supply to ALL hot and cold taps and should be turned on at the start and off at the end of your visit. All waste water is treated using a bio digester situated next to the large car park. This will break down most waste items but we ask that only toilet paper is flushed down the toilet. It is against the law to smoke or use e-cigarettes anywhere inside the bunk house. Smoking is not permitted around the bunk house or on the patio or car parking areas. For those wishing to smoke, the designated area is at the rear of the main car park near the stream. All cigarette butts shall be disposed of in a safe manner and removed from the site – these must not be placed within the bunk house internal or external bins. Animals are not permitted to enter the bunk house at any time. They are permitted on the surrounding patio and car parks. Any resulting mess must be cleaned up i.e. urine must be washed away and excrement must be picked up and the area washed. Excrement must not be placed in the bunk house bins. There is a detailed bunk house manual in the lounge and all visitors MUST sign in using the bunk house log book on arrival. Visitors must familiarise themselves with the evacuation routes to be used in the event of the fire alarm sounding. There are three internal fire doors which close once you have passed through. None of these doors must ever be propped open. In the downstairs rear bedroom is an emergency exit door which also serves as the emergency exit from the en-suite room. This door is never locked and is operated by a crash-out bar. The door should not be blocked with bags, etc. Make sure you know how to operate the door and make sure it is properly closed at the end of your visit. In the case of an evacuation of the building, the assembly point is the car park on the opposite side of the road. All the beds have a washable mattress and pillow, but all visitors must bring their own sleeping bag. We have several waste bins on site and there is a notice about which bins to use for food, recyclables etc. Please note in particular that ‘non-recyclable general waste’ should be placed in the supplied black bin bags prior to tying and depositing them in the green bin. This requirement is because waste removal from the bunkhouse is via manual loading onto a caged wagon. Conventional rubbish wagons cannot access the bunkhouse due to road width restrictions. It is the Parent or Guardian’s responsibility to ensure that any children visiting or staying in the bunkhouse are supervised at all times. Children under the age of 10 should be carefully supervised if allowed on the top bunks. If you are camping or doing activities with children in the area of the pond, you may wish to have to hand the safety life ring which is stored in the right hand shed. All walking boots and muddy footwear must be removed in the entrance hall and stored on the racks provided. It is requested that the wearing of any outdoor footwear is limited within the bunkhouse, and if possible, not at all in the bedrooms. No outdoors shoes are permitted inside the wet room (except in an emergency). We provide a limited number of slippers. The kitchen is fully equipped with all necessary cooking utensils, crockery and cutlery. It should also have sufficient kitchen towel, tea towels and cleaning implements necessary for your stay. Spare materials are stored in boxes under the kitchen units. On arrival check that the fridge doors have been left open and that no foods have been left in. Throw away any food left in the fridge unless someone else is staying in the bunkhouse. If you only need one fridge and do not have any frozen food use the full-size larder fridge. Leave the other one turned off. If you have frozen food and the half size larder fridge is sufficient for your party please use just that one. On departure please turn off the fridge(s) you have used, empty the contents and wipe out as appropriate. Make sure the doors are all left open to prevent mould growing (there are sponges to prop the doors open). There should be sufficient toilet rolls, kitchen towels, clean tea towels, soap, black bin bags and cleaning products for your stay. If you notice any of these are running low, please note in the bunkhouse log book and also notify one of the Wardens on your departure. There are three external doors. To conserve heat in the building, try only to use the main door – especially in cooler months. Check that all doors and windows are correctly shut and locked at the end of your visit. There is no mobile phone signal at the bunkhouse, nor is there a landline installed. The nearest reasonable phone signal is in Beddgelert. However, in an emergency, we suggest using the phone at the Cae Du campsite which may be open and can be seen from the bunkhouse. You are required to clean the bunkhouse on your departure. If you have sole occupancy you are responsible for the whole bunkhouse. If you are staying in the bunkhouse with other groups or club members, please liaise with your fellow guests and clean up as necessary. Showers When you have finished using one of the showers, please use the shower wall squeegee and shower cleaner. When showering in the wet room, please also squeegee the floor. If you have used either or both of the outside camping areas during your stay, please ensure you have left them tidy. All visitors using the car parking and hut do so at their own risk and neither the Lancashire Mountaineering Club, nor any person acting on its behalf, is in any way responsible for any loss, injury or damage sustained by them or for loss or damage to vehicles, and to contents left within the hut or in the car parking areas.